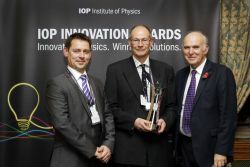 Representatives of ZephIR Lidar attended a reception in Parliament on Wednesday (6th November) to receive the Institute of Physics (IOP) Innovation Award from the Secretary of State for Business, Innovation and Skills, the Right Honourable Dr Vince Cable MP. Figure 1: (l-r) ZephIR Lidar’s Managing Director Ian Locker, Chief Scientist Dr Michael Harris and the Right Honourable Dr Vince Cable MP. The IOP Innovation Awards recognise companies in the UK and Ireland that have built success on the innovative application of physics. The award will be formally presented at the annual IOP Awards dinner on Friday 15th November. Based near Ledbury, Herefordshire, ZephIR Lidar were the first company to develop a commercial lidar system, and since 2003 have pioneered the use of the technology for wind anemometry. In 2003 the company released the first commercial wind lidar, ZephIR, exploiting decades of research at UK government Research & Development establishment QinetiQ, further optimised for the wind industry by leading international renewable energy consultancy and sister company Natural Power. 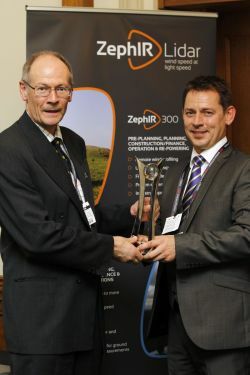 ZephIR has paved the way for many of the remote sensing devices seen in the market today and whilst the ZephIR Lidar team continue to innovate with world firsts addressing complex client requirements, the system has now amassed more than 4 million hours of operation across over 750 deployments globally, spanning a decade of commercial experience. Business Secretary Vince Cable said: “I would like to congratulate all of the winners of this year’s IOP Innovation Awards. The UK is home to some of the most innovative businesses in the world, especially in sectors such as manufacturing and telecommunications which draw on disciplines like engineering which have a base in physics. Figure 2: Dr Michael Harris (left) and Ian Locker with the Innovation Award. ZephIR 300 measures wind characteristics onshore and on fixed or floating platforms offshore from just 10 metres (33 feet) up to 300 metres (984 feet) from installed position to inform wind regime and quality studies during the development and operation of wind farms onshore and offshore. ZephIR 300 is accurate, reliable and affordable, adding value to wind energy projects at every stage – from pre-planning, through development and on to operation. Every system is uniquely subjected to an industry-approved validation process, part of which occurs at the UK’s Lidar and Sodar test site, ensuring repeatable finance-grade data. In 2003 we released the first commercial wind lidar, ZephIR®, exploiting decades of research at UK government Research & Development establishment QinetiQ. Designed specifically for the wind industry ZephIR has paved the way for many of the remote sensing devices seen in the market today. Our original lidar technology continues to innovate with world firsts such as taking measurements from a wind turbine spinner and being the first to deploy an offshore wind lidar, both fixed and floating. ZephIR has also now amassed more than 4 million hours of operation across 750+ deployments globally spanning a decade of commercial experience. For wind measurements onshore, offshore and in turbine-mounted applications, ZephIR provides accurate, reliable finance-grade wind data. ZephIR Lidar was awarded one of the most coveted honours in British science, the Institute of Physics Innovation Award for “developing and commercialising a novel ‘lidar’ anemometry system for use in wind farm siting and construction”.